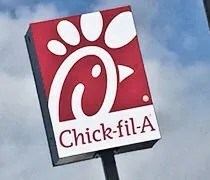 I bet you’re tired of hearing about Chick-Fil-A, aren’t you? I am yet I can’t stop eating there. I mean, it’s good, but is it really wait in the drive thru line for 40 minutes good? Yeah…..I’m not waiting in any long line for fast food. The few times we’ve gone since it opened, J has went and went inside instead of waiting in that long drive thru line. I have avoided the place so far….until last Friday. I wanted to try the breakfast. J has been telling me how good the breakfast is. I’ve only ever had the chicken sandwich, so I knew I had to try breakfast at some point. 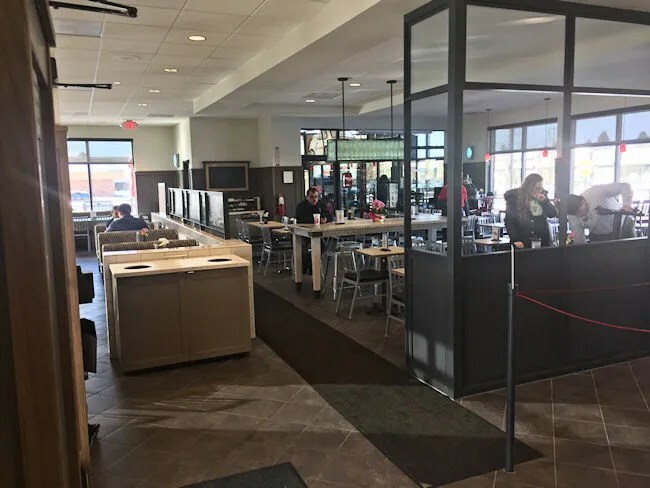 The Portage Chick-Fil-A is the third one to open on the west side of the state and the first in Southwest Michigan. I’ve been to both the Gaines Township and Wyoming locations in the Grand Rapids area a time or two but always for lunch or dinner. I was hungry after I dropped L off for school on Friday morning and I needed to stop at Meijer, so I just kept going south until I hit the Chick-Fil-A. The Portage store takes over the space that used to be Bilbo’s. 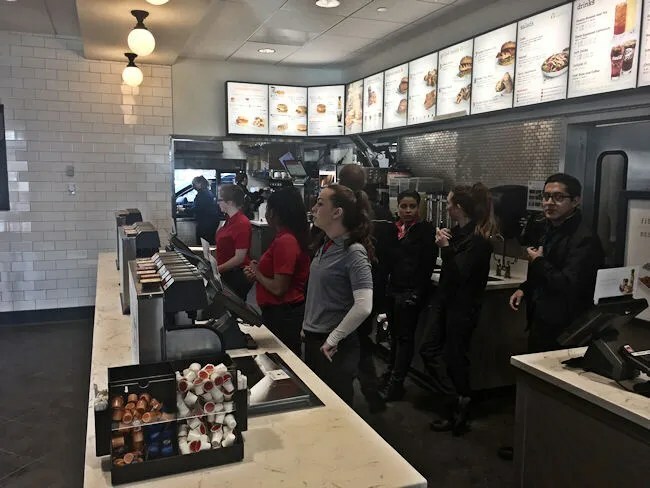 I know a lot of people were sad to see that business go, but many more were happy to see Chick-Fil-A move in. The store is right along South Westnedge in the Southland Shopping Center. The building is a completely new structure. 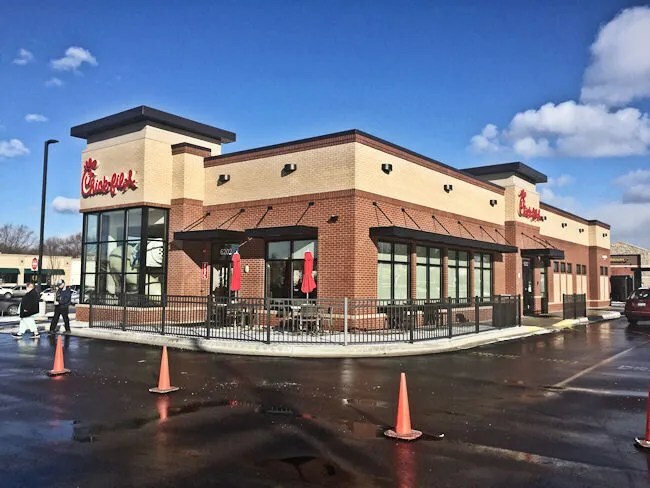 The Bilbo’s was torn down and Chick-Fil-A built from the ground up. The foot print isn’t nearly large enough for the amount of traffic going through the first couple of weeks. I stopped in just before 9:00 on a Friday morning and the parking lot was virtually empty. 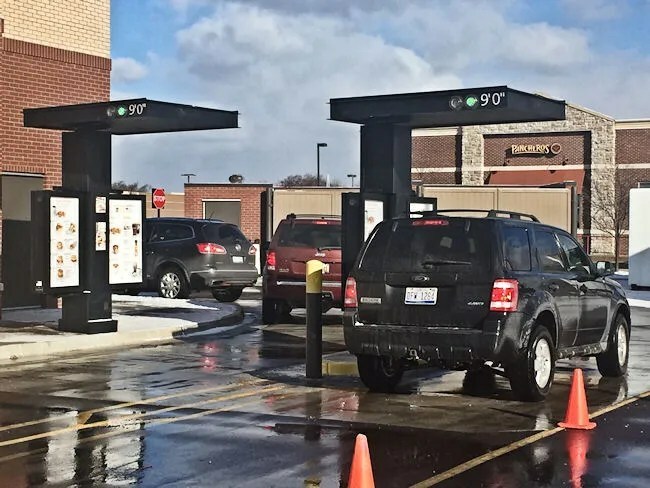 There were maybe five or six cars in the drive thru and just one or two parked in the space on the outside of the lot. I picked a good time to stop. When I got inside, there was no line at the order counter. I didn’t know what I wanted because I’ve never looked at the breakfast menu before. There were three people all waiting to take my order and the breakfast menu is kind of around the corner from the rest of the menu so I had a hard time locating it. J had suggested a couple of things to me so I knew sort of what I wanted. I picked the Bacon, Egg, and Cheese biscuit meal which comes with hash browns and a drink. I passed on the coffee and went for a Coke instead. I also got a four pack of Chick-n-Minis because that’s what everyone has told me to get at Chick-Fil-A for breakfast. The cost of meal was a little over $9. I was handed a Coke and told to wait just off to the side of the order counter. Had we opted to dine in, there is a large dining room behind the order que that even has a small play area for the kids. L tells me “It’s just a slide,” but B and I didn’t go look at it. It took about five minutes for someone to come from the kitchen area with my bag of food. I got B back into his car seat then we headed home to eat. I started with the Bacon, Egg, and Cheese biscuit because that’s typically my favorite breakfast sandwich. This sandwich is exactly what it’s advertised as. 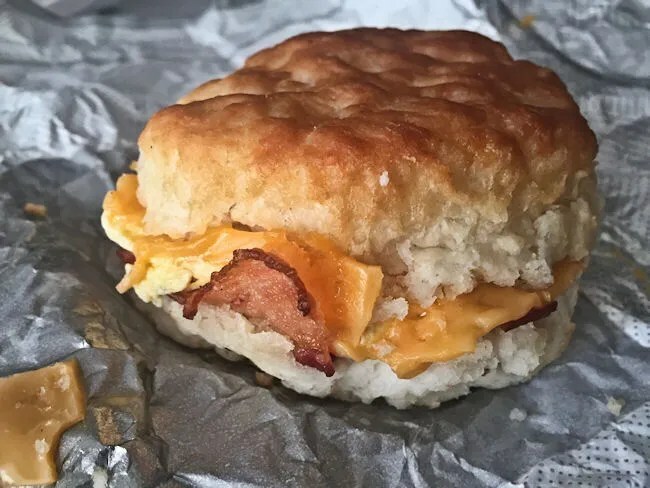 Bacon, egg, and cheese on a biscuit. The defining thing to me was the biscuit which was a little doughy. It wasn’t a flaky biscuit like I was expecting, but more like something that was maybe even a little under cooked. Still delicious and still something I would order again. 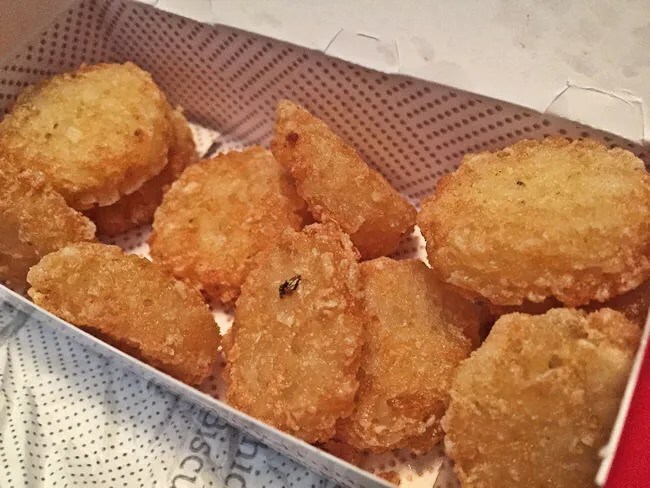 I opened the box of hash browns next. These were little potato coins that are cooked in canola oil. I shared these with B since they were about his size. He ate a couple and so did I. They weren’t my favorite thing, but I’m guessing they won’t give me fries for breakfast. They were fine and would probably be better with one of the many dipping sauces Chick-Fil-A offers. Up last was the Chick-N-Minis. I got the four pack which comes neatly tucked into a little box. 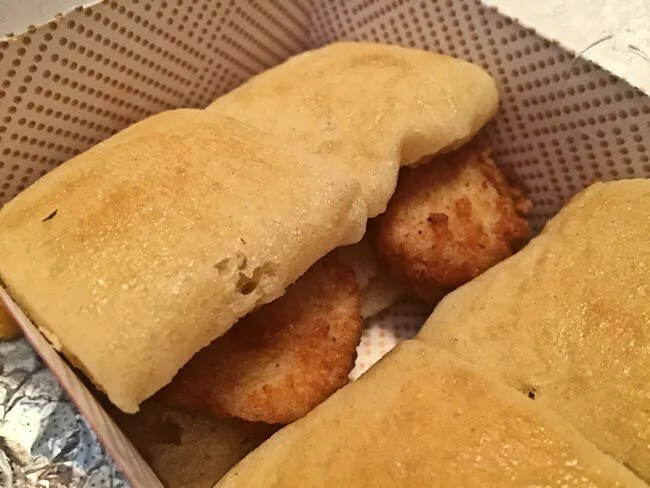 The bite size sandwiches are small chicken nuggets wrapped in a small yeast roll. This was probably my favorite thing from breakfast. Like the biscuit, the yeast roll was pretty doughy, but it worked in this kind of sandwich with the crunchy chicken. Breakfast from Chick-Fil-A pretty much lived up to the hype. Again, I don’t go crazy for Chick-Fil-A, but I do enjoy it. I’m not going to wait in any line for breakfast, but if I drive by again and it looks like I can get in and out, I will gladly be back for breakfast.